National Star Wars Day, 2010. 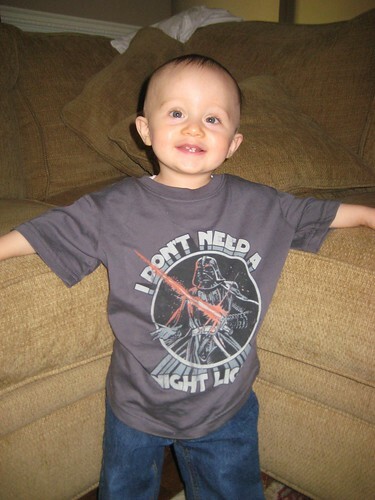 As you can see, the Vader shirt is showing off how much it has been loved! I remember taking this picture a year ago today and I couldn't BELIEVE how big Henry looked. I think the exact same thing about the picture from this morning. Good lord, time really does fly. I love the idea of Nick driving around with a cut-out Yoda!! Tim and I plan on dressing our child in so many things for holidays and I was just thinking the other day how cute it would be to get something Star Wars because of how much Tim loves it, and I completely forgot about May 4th, but now we'll have an excuse to go all out! So cute!! 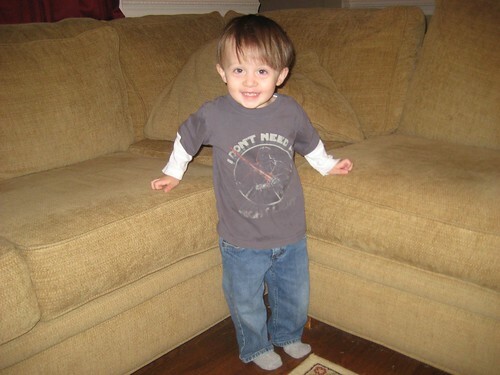 We had a shirt that Michael wore forever which had Darth Vadar that said: "Come to the Dark Side. We have cookies."